14 Hereford is located on the east side of Hereford, between Beacon and Marlborough, with 12 Hereford to the north, across Public Alley 415, and 16 Hereford to the south. 14 Hereford was built ca. 1871 for builder and contractor George Martin Gibson, one of four contiguous houses (14-16-18-20 Hereford) built for speculative sale. Click here for an index to the deeds for 14 Hereford. On October 7, 1871, 14 Hereford was purchased from Frances Gibson by Anita P. (Jones) Pratt, the wife of real estate dealer William Pratt. They previously had lived at 10 Louisburg Square. He was the son of George W. Pratt, from whom Frances Gibson had purchased the land for 14-20 Hereford. William and Anita Pratt continued to live at 14 Hereford during the 1882-1883 winter season, but moved thereafter to Manchester, Massachusetts. On September 18, 1883, 14 Hereford was purchased from Anita Pratt by Elizabeth (Bond) Freeman, the wife of Anthony Forbes Freeman, a merchant. They previously had lived at the Hotel Berkeley (southeast corner Berkeley and Boylston). They also maintained a home in Brookline. A. Forbes Freeman died in October of 1899. Elizabeth Freeman continued to live at 14 Hereford. By the 1924-1925 winter season, she had been joined by Elise Murray (Ballou) Dale, the widow of William Johnson Dale, Jr. William Dale, Jr., was Elizabeth Freeman’s maternal first cousin, the son of William Johnson Dale and Sarah Frances (Adams) Dale, the sister of Elizabeth Freeman’s mother, Caroline Matilda (Adams) Bond. 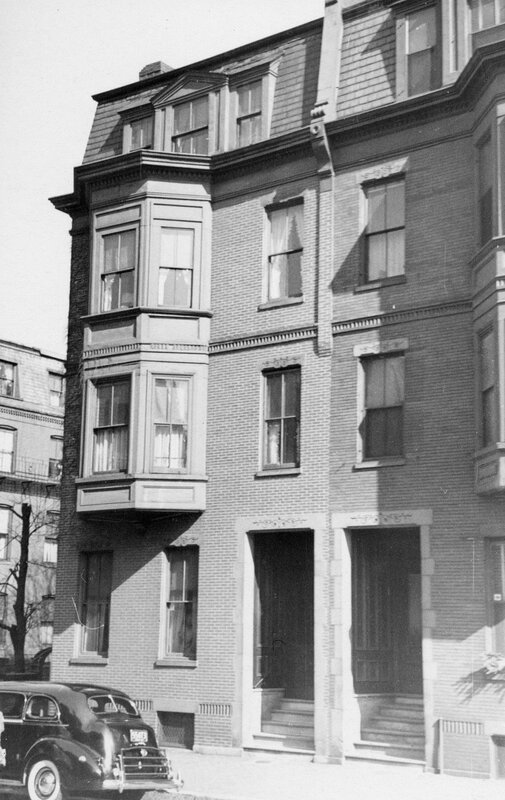 Elizabeth Freeman and Elise Dale continued to live there until Elizabeth Freeman’s death in September of 1928. 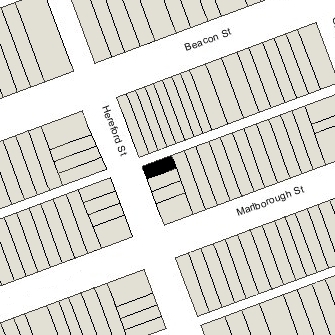 By 1930, Elise Dale was living at 329 Commonwealth as a lodger. The Freemans had no children and 14 Hereford was inherited by Elizabeth Freeman’s maternal first cousin, Marion DeLeon (Adams) Page, the widow of Gordon Prince Page. She was the daughter of Joseph Henry Adams, Jr. (the brother of Elizabeth Freeman’s mother) and Adeline (DeLeon) Adams. Marion Page lived in an apartment at The Empire at 333 Commonwealth. 14 Hereford was not listed in the 1929-1931 Blue Books, nor in the 1929-1931 Lists of Residents. 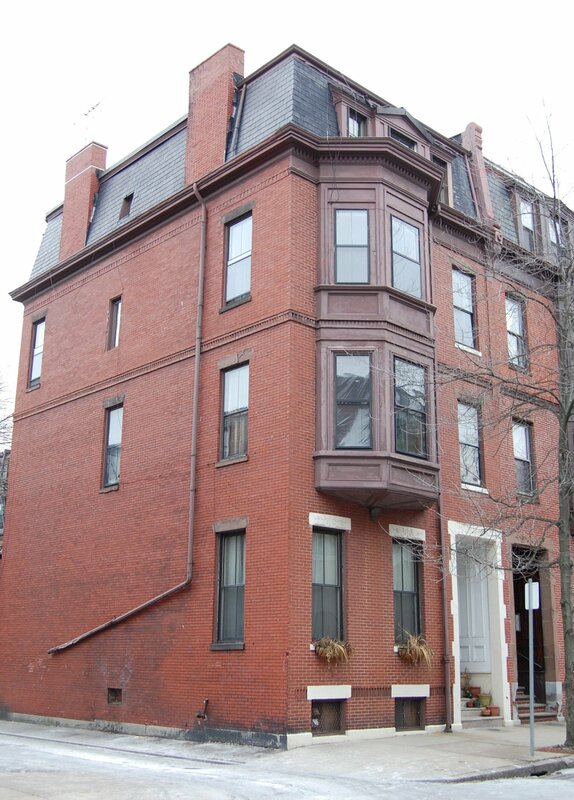 On May 11, 1931, 14 Hereford was acquired from Marion Page by Shirley Clifford Speed, a real estate dealer who converted many Back Bay houses into lodging houses and apartments. On June 15, 1931, 14 Hereford was acquired from S. Clifford Speed by Miss Rose A. Flood, a nurse. She and her sister, Elizabeth M. Flood, operated the property as a lodging house. They previously had lived at 41 Fairfield, where they also had operated a lodging house. Their brother, John G. Flood, was living with them at the time of his death in February of 1942. Rose and Elizabeth Flood continued to live and operate a lodging house at 14 Hereford until the late 1940s. On September 9, 1948, 14 Hereford was acquired from Rose Flood by David William Gurton, Jr. He and his wife, Helene S. (Phillips) Gurton, made it their home. They previously had lived in an apartment at 186 Commonwealth. David Gurton was an architect; Helene Gurton was a women’s clothing buyer and formerly had operated a women’s clothing store in the Copley Plaza Hotel. On August 22, 1949, David Gurton transferred the property into his and his wife’s names. In March of 1951, they applied for (and subsequently received) permission to convert the property from a lodging house into three apartments. On November 24, 1953, 14 Hereford was acquired from the Gurtons by Miss Marion S. Hodgdon, a real estate dealer, and on December 30, 1953, it was acquired from her by Tibor D’Ehrmanns. He lived at 112 Newbury and operated Ehrmanns Antiques at 283 Dartmouth. In March of 1954, he applied for (and subsequently received) permission to increase the number of apartments from three to four. On June 12, 1959, 14 Hereford was acquired from Tibor d’Ehrmanns by Miss Mazie Elfreda Hodge, a secretary, who lived at 122 Marlborough. On May 9, 1963, 14 Hereford was acquired from Mazie Hodge by George L. Reef, a lawyer. He was a lodger at 379 Marlborough. On November 27, 1963, it was acquired from George Reef by Richardson Stoughton, an insurance and real estate agent who lived in an apartment at 235 Beacon and then at 650 Huntington. On April 25, 1974, 14 Hereford was acquired from Richardson Stoughton by Peter K. Gearhart, Ann L. Sawyer, and Nicholas J. Gervasi, partners doing business as Architectural Renovations. On March 10, 1975, they transferred the property to Hereford Street Associates LLP, in which they were the partners. 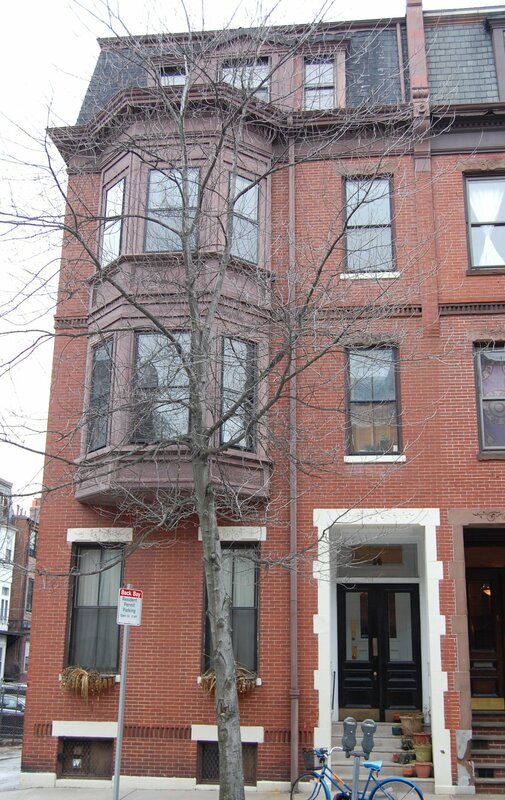 On the same day, Hereford Street Associates converted the property into four condominium units, the Fourteen Hereford Street Condominium.